Ooze Splash Guard QUARTZ GLASS Coils 3pack is made with the consumer in mind. Enjoy a much deeper coil to fit more of your concentrate. 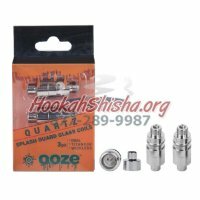 The splash guard coil is a QUARTZ GLASS dual coil. QUARTZ GLASS coils burn your concentrates at ideal temperature for a hit that is comparable to a dab rig. It was made to protect you precious glass piece.